TigerChef Full Size Aluminum Sheet Pan 18" x 26"
TigerChef > Browse by Store Type > Bakery Shop > Baking Pans >< Sheet Pans > TigerChef Full Size Aluminum Sheet Pan 18" x 26"
$9.53 Winco ALXP-2618H Heavy Weight Aluminum Sheet Pan 18" x 26"
$8.74 Winco ALXP-1826P Perforated Aluminum Sheet Pan 18" x 26"
$6.53 Winco ALXP-1826 Full Size Aluminum Sheet Pan 18" x 26"
$5.45 Winco ALXP-1318P Perforated Half Size Aluminum Sheet Pan 13" x 18"
$4.04 Winco ALXP-1318 Half Size Aluminum Sheet Pan 18" x 13"
$17.13 Vollrath 68100 Wear-Ever 18 Gauge Aluminum Party Pan 16" x 11"
$7.13 Vollrath 5303 Wear-Ever Heavy Duty Half Size Aluminum Bun / Sheet Pan 18" x 13"
$15.92 Winco ALXP-1200 Full Size Aluminum Sheet Pan 18" x 26"
$8.09 Thunder Group ALSP1826PF Full Size Aluminum Perforated Sheet Pan 18" x 26"
$3.99 Thunder Group ALSP1813 Half Size Aluminum Sheet Pan 18" x 13"
$6.19 Thunder Group ALSP1826 Full Size Aluminum Sheet Pan 18" x 26"
$35.99 Thunder Group ALBA0214 Bake Pan 26-1/4" x 18-1/4"
$5.09 Thunder Group ALSP1813PF Half Size Perforated Aluminum Sheet Pan 18" x 13"
$6.39 Thunder Group ALSP1826M Full Size Aluminum Sheet Pan 18" x 26"
Perfect for baking cookies, sheet cakes, rolls and other delectable baked goods, the TigerChef Full Size Aluminum Sheet Pan 18" x 26" is a valuable addition to both home and commercial kitchens. 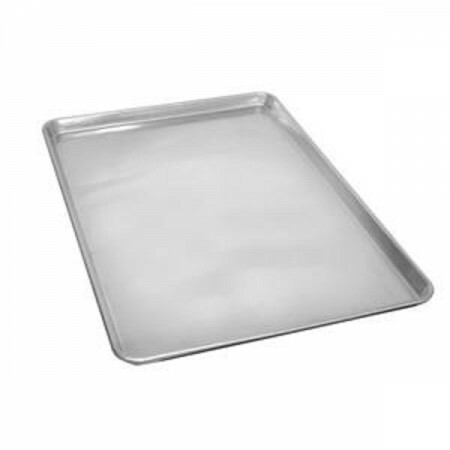 Crafted from heavy duty 19-gauge aluminum, this commercial grade sheet pan distributes heat quickly and evenly across the surface for uniform baking and cools down quickly for safe handling. Its rolled edge style has a wire reinforced beaded rim that prevents warping, and helps it maintain its structure and shape even after repeated use. This full-size aluminum sheet pan is stackable when not in use, to save valuable storage space in your bakery or commercial kitchen. In addition, thanks to its rolled edges it is easy to handle, and it can be placed in a sheet rack to cool. This highly durable commercial quality sheet pan is also NSF listed making it easy to clean and maintain. These pans suit my purpose nicely. I have a bakery rack that I use in my pottery studio, and the trays serve as shelves for my drying pottery.